The maker of the highly anticipated video game No Man's Sky has revealed a legal challenge that threatened the game's name. Sean Murray said his studio had endured "years of secret stupid legal nonsense" after the broadcaster Sky said the game's title infringed its trademark. "We finally settled with Sky (they own the word sky). We can call our game No Man's Sky," he tweeted. The game was expected in June, but has been delayed until August. 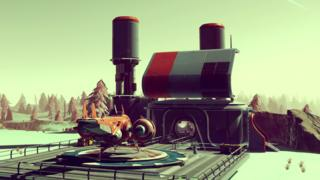 Hello Games has not revealed whether it paid Sky to settle the lawsuit. "I now know more about trademark law than any sane man would ever want to," tweeted Mr Murray in a follow-up post. The studio is not the first company to face a legal challenge from Sky, which provides satellite television and broadband services in Europe. In 2013, Microsoft had to change the name of its cloud storage service SkyDrive to OneDrive, following an infringement claim. A year earlier, US technology firm Livescribe pulled its Sky pen from UK stores after receiving a legal challenge from the satellite broadcaster. It renamed the product "Livescribe wifi smartpen" and recalled stock using the old name. Sky told the BBC it had no comment on the dispute.